Make fights flashier by making AI use more varied moves. This mod has been uploaded with permission from the original author - BLKCandy. Make flashier fight by making AI use more varied moves and attack faster. 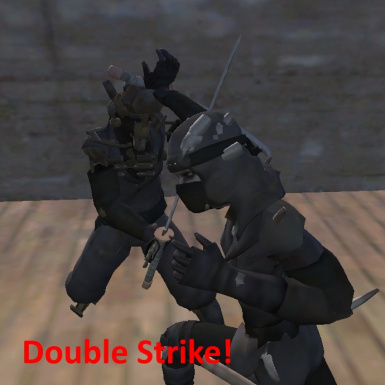 - Enabled all weapon moves for all weapon types, including martial art moves for armed combat. - Changed a lot of attack animation min and max trigger range. They should use more varied moves, but also probably miss more. - Close range martial art moves like low kick and punches max trigger range reduced for armed combatant so that the character would use their weapon unless they are very close. - long range attack like heavy down cut or jump kick got their minimum trigger range reduced so that they can be used closer. - Also changed some move preferences. Combo, left cut, and heavy swing are used more often. Combos are nice looking and effective. Left cut and heavy swing are good CC. And they represent downward swing, left swing, and right swing respectively. Katanas prefers using their combos making them good against single target. 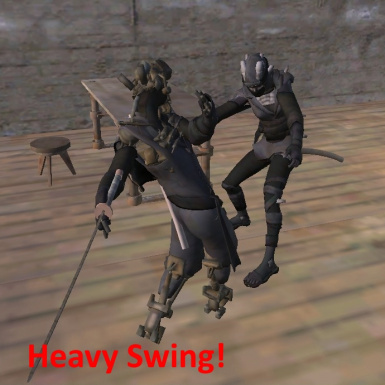 Heavies prefers their heavy swings so they work great in group fight. - Increased all attack animation speed by 10% Faster Attack! - Increased all defense animation speed by 20% Stronger Defense! - Increased all stumble animation speed by 30% Faster Recovery! Allowing more chance to turn the table! - Heavy weapons using light weapons move recieved small damage penalty. - Light weapon using heavier moves recieved small damage boost. - Weapon using martial art moves took damage penalty but recieved high speed boost. They have poor AOE, got to compensate with speed. - Increased max simultaneous hits for every moves, katanas and those smaller weapons should do better in group fight. 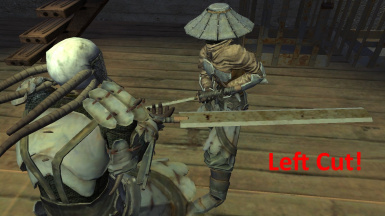 - Do note that there are lots of incorrect/weird weapon placement because the mod use animations unintended for those weapons. (Like using heavy moves with katana or vice versa. Or using martial arts with weapons.) I did not make the animations, all animations are from base game. 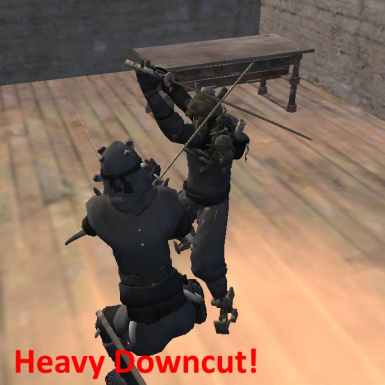 Heavy Downcut - Charge forward and swing the weapon down hard. Longest range and thus the most common opening move. 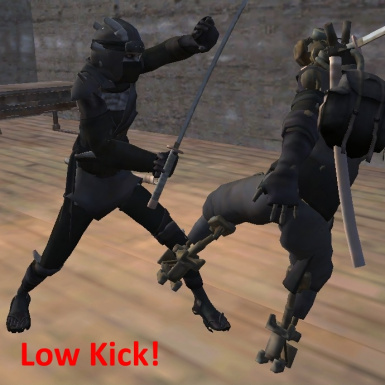 Flying Knee - A mid-long range flying knee attack. 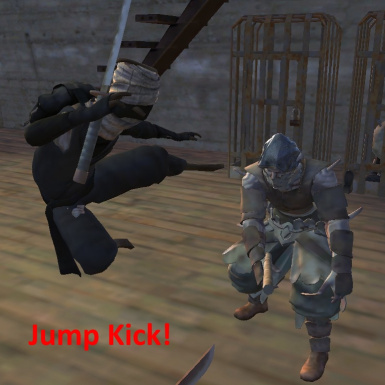 Jump Kick - jump forward and kick.enemy in medium-long range. Combo - Press forward with 2 swing combo. 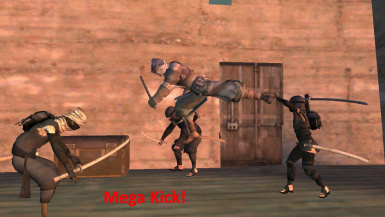 Mega Kick - spinning double kicks that looks cool but miss a lot. Heavy Swing - Full body golf swing from lower left all over to the back right. Sweeping somthing like 270 degree around the user. Mad area attack which left user with huge opening. Downcut - a simple single downward swing. Left cut - pull back the weapon to the waist and make a very short quick cut with the waist. 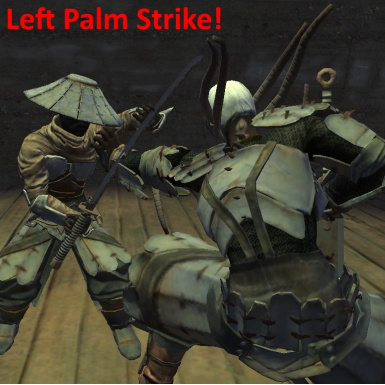 Left palm strike - Take a large left step forward and strike with the left palm. Low Kick - a quick low kick with the left leg. Double punches/strikes - very close range one-two combo. There are so many changes in attack animations that this mod probably affect the game balance. If you feel some moves are imbalanced, too weak or too strong, or if there is any change you would like, please leave comments below.